Construct a callback for dealing with the wearables. Definition at line 882 of file llagent.h. Definition at line 885 of file llagent.h. Would like to pass the agent in here, but we can't safely count on it being around later. Just use gAgent directly. todo Bitmask of actions to take on completion. Definition at line 5974 of file llagent.cpp. Definition at line 5983 of file llagent.cpp. 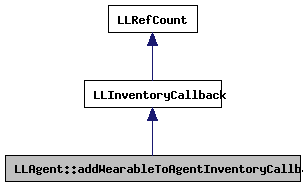 References LLAgent::addWearabletoAgentInventoryDone(), CALL_CREATESTANDARDDONE, CALL_MAKENEWOUTFITDONE, CALL_RECOVERDONE, CALL_UPDATE, LLAgent::createStandardWearablesDone(), gAgent, LLUUID::isNull(), LLAgent::makeNewOutfitDone(), mIndex, mTodo, mWearable, LLAgent::recoverMissingWearableDone(), and LLAgent::sendAgentWearablesUpdate(). Definition at line 914 of file llagent.h. Definition at line 911 of file llagent.h. Definition at line 913 of file llagent.h. Definition at line 912 of file llagent.h.